Generally, the term potentiometer is used to represent a three-terminal variable resistor. In technical terms, the potentiometer and rheostat represent two different configurations in which a variable resistor can be used. In this post, you'll learn the 3 essential differences between both. The potentiometer configuration is used to fed voltage in any circuit. 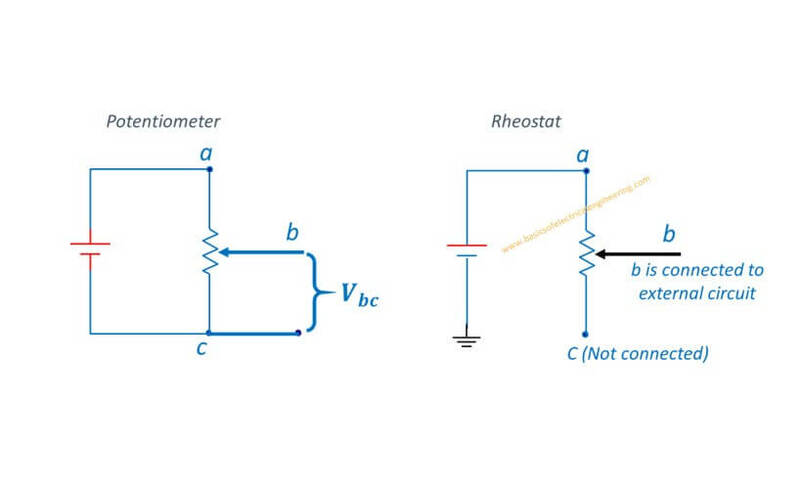 Whereas the rheostat is used in series to vary the amount of current. During pot operation, all the three terminals of the potentiometer come in action. Whereas the rheostat configuration utilizes one central and one edged terminal. Mostly some input source is supplied to pot from which a variable voltage supply is taken and then fed to the circuit. While the rheostat is used in series with the already powered circuit to change its characteristics.